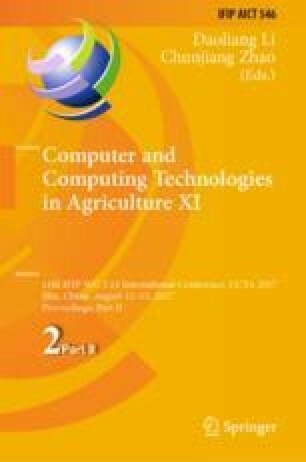 A new method for nondestructive measurement of moisture content of particulate agricultural products is developed using microwave mixing technique. A double horn system with a relative vertical distance of one-fourth wavelengths is designed to measure the reflected microwave signals. The particulate materials are interacted with microwave at a frequency of 10.5 GHz, and the reflected microwave signal is mixed with the launch signal. Corns with different moisture contents are chosen as samples. Calibration models for moisture content are proposed in accordance with the measurement of the differential attenuation of the microwave mixing signal. A moisture content from 6.8% to 30.1% is obtained with a coefficient of determination of 0.98 and a standard error of calibration value of 1.12%. This work was supported by Jilin Scientific and Technological Development Program (No. 20180520016JH) and the Scientific Research Foundation of Jilin Agricultural University (No. 201719).